This dish is unusual for me, as I don’t normally use tofu in ‘South Asian style curry' based dishes. I am always happy to use fresh vegetables, but I had picked up this tofu to compliment the dried Chinese mushrooms - a broth of sort had come to mind, however it had not been used and it was fast reaching its use by date. As Tofu is not a particularly affordable ingredient to purchase, I did not wish to waste it. I have a wish that one-day I’d like to have a go at making my own, but until that day (should it arrive) I’m relatively happy with this brand. This is a mild spiced curry with absolutely no chilli heat at all. The flavours were fine, but I personally don’t think the tofu worked well here, as it was too soft and did not absorb the flavours. But I understand its addition here as it was designed with our vegan friends in mind. 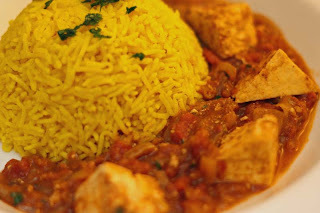 If you not vegan, I think ‘paneer’ a Indian tofu like cheese would work well, it has more texture and bite, even mock 'chicken' style pieces would work which would have been Ds preference. Rinse and rain the rice. Heat he oil in a saucepan with a tight-fitting lid. Add the rice and turmeric and stir on high heat for a minute or two. Add the water and salt, bring to the boil, then turn down to a gentle simmer. Cover with a tight fitting lid and cook covered for 15 minutes, or until the water is absorbed. Fluff the rice with a fork, and let sit until ready to serve. In a large saucepan with a lid, cook the onions in the oil on medium heat until softened. Add the garlic, ginger, curry powder, garam masala, salt and tofu. Cover and cook on medium-low heat, stirring frequently. Add the tomatoes, and simmer for 15 minutes for the flavor to develop. Occasionally stir gently so not to break the tofu. Serve with rice. Adapted from Moosewood Collective Simple Suppers. Your food always looks so very tempting, even tofu, which is not on the top of my list of fave foods. That looks really moreish Mangocheeks, but then your food always does. You should check to see if you have a chinese supermarket near you. You can but your tofu so much cheaper there. Our supermarket is called Matthews (i think there is a big one in Glasgow too). Today I was buying silken tofu. They had a buy three for the price of two on all tofu and I got 3 blocks for £1.60. I also got a couple of lovely bowls and a cloth for virtually nothing. I love tofu, but I always associate it with Chinese cookery. Your suggestion of paneer (which I also love) sounds a better option. However you don't know until you've tried something. For me the creamy blandness of tofu or paneer are the perfect foil for the aromatic sauces. I'm trying to eat less meat so I think I'll be back from time to time to check out some of your interesting recipes. 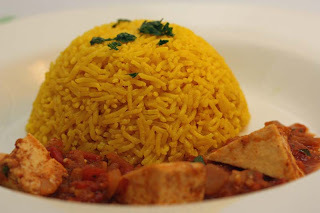 I never tried making rice with turmeric. I should try it out! I love curry flavor of tofu. this is my first time seeing tofu cook in curry, come to think of it, the combination sounds really delicious! 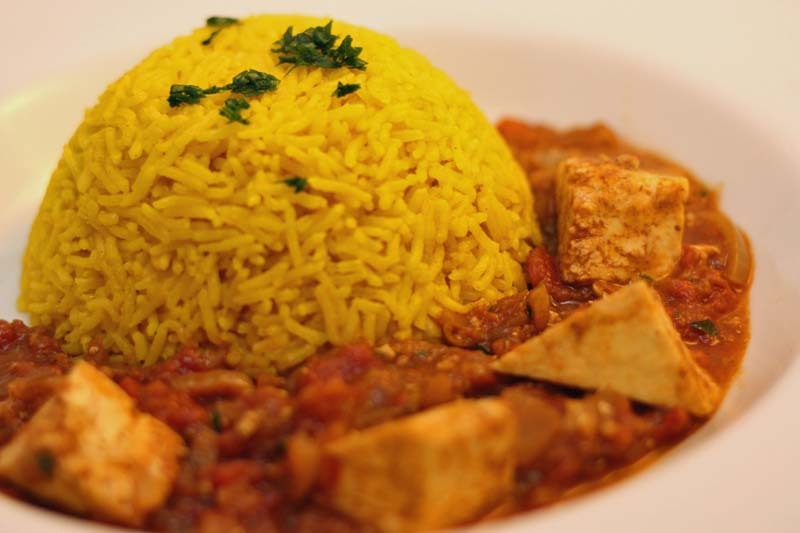 because tofu by itself can be really bland and hot spicy curry can help to hype it up. good job! I really liked the rice, so will be making it again. Thanks so much just Gai. It only recently that I've begun to appreciate tofu, but still have a long way to go in loving it. I don't eat much Chinese or Oriental based cuisine, so part of my 2011 to do's are to attemtp to east more cuisine from this part of the world. You must, it was really good. The dishes certainly have some colour. Sadly, I may have to follow suit as this was spongy. I agree in the past the brand was much firmer. Jacqueline suggested checking out the Chinese Supermarkets. I will be doing that. I've nver had smoked tofu. Something to try. Thanks so much for the suggestions. WOW! That so looks SO good! Oh, God! This looks really, really good! I'm hungry already, hehe. Thank you so much Miki. Looks so delicious & easy! Adding this to my menu for the week.